Three American servicemen are returning home from World War Two. They hitch a ride in the same B-17 bomber that will take them all back to their Middle American home town of Boone City. 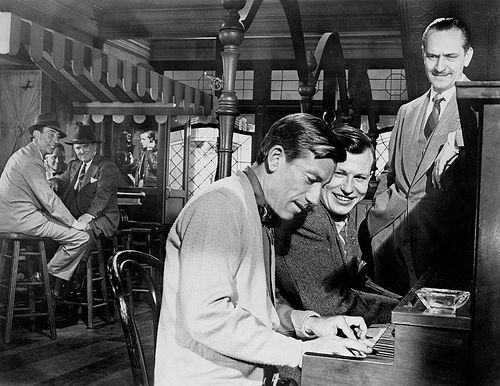 The three men are Fred Derry (Dana Andrews), Al Stephenson (Fredric March) and Homer Parrish (Harold Russell). The men represent the three different services (Air Force, Army and Navy), with Fred an Air Force officer and bombardier, Al an army sergeant and Homer a sailor. The three men all have the same general problems with returning to civilian life, as well as their own specific problems relating to their individual circumstances. Al (March) was a senior figure in a bank before the war. He returns to his old job with relative ease, but has to reconnect with his wife (Myrna Loy) and family. His children are now bordering on young adulthood and he has missed seeing them grow up. His son doesn't show much interest in his war mementoes and, worst of all, the maid has left them, leaving his daughter to do the dishes. He settles back into his job at the bank, where he has to approve loans to ex-servicemen. One loan, to a man who wants to buy a farm, brings him into conflict with his superiors. Al feels that they should do more for the men returning from the war and help them to create new lives and businesses. In the army, he was used to working on his instincts, making quick decisions and judging a man by his character. In the bank, however, it's simply a tick box culture. Out of sorts with his family and his job, Al becomes just a little bit too reliant on alcohol to help him cope. Fred (Andrews) was a soda jerk in a drug store before the war and he doesn't know what he's going to do now he's been demobbed, but he knows one thing for sure, he's never going back to that drug store again. The Air Force has turned him into an officer and a gentlemen, well an officer anyway, and he expects more. But he struggles to find work, learning that there's not much demand for bomb aimers in peacetime. Eventually he has to go back to working in the drug store, where he finds his old assistant is now his supervisor. Fred is plagued by a recurring nightmare about his experiences in the war and suffering from what we would now recognise as Post Traumatic Stress Disorder. He also finds that his marriage is in trouble. He married his party girl wife Marie (Virginia Mayo) during his aircrew training and they have spent only a couple of weeks of married life together. Marie is decidedly unenthusiastic about living on his meagre wages at the drug store, especially after she's been used to living on an officer's salary, and only finds Fred attractive when he's wearing the Air Force uniform that he's struggling to cast off. His attempts to save money by eating at home and cutting down on going out also go down badly, and Marie begins to look elsewhere for company. The last of the three men is former sailor Homer (Russell), who has lost his hands in an explosion on board ship and now uses hooks instead. He is especially apprehensive about what his family and friends will make of his hooks and struggles to be treated normally. Most of all, he's concerned about the reaction of his girl, Wilma (Cathy O'Donnell), and wonders if she will still want to marry him. The Best Years of Our Lives was inspired by an article in Time magazine about US Marines returning home from WWII. The screenplay had a slightly tortuous evolution, with the independent producer Samuel Goldwyn commissioning author and journalist MacKinlay Kantor to write it. Kantor's version was published as a blank verse novel "Glory for Me", and the book was then adapted by Robert E. Sherwood into a finished screenplay. The film reunited Goldwyn with his contract director William Wyler. Wyler had made several prestige pictures for Goldwyn, including Dead End (1937), Wuthering Heights (1939) and The Little Foxes (1941), before joining the US Army Air Corps to make documentaries. The film re-teamed Wyler with his regular cinematographer of the 1940s, Greg Toland, and editor Daniel Mandell. The film finds William Wyler on top form, drawing strong performances from his cast and shooting in a restrained style that rarely draws attention to itself. Robert E. Sherwood's intelligent script weaves the stories of the three men and their families together in a way that doesn't feel contrived, and the film is aided by Greg Toland's intelligent use of deep focus photography, enabling us to see the different elements of a scene unfold. At 170 minutes, the film is very long for a 1940s production, but it manages to justify its length with involving and occasionally moving characters and relationships. The film perfectly captures the mood of the immediate post-war period, the hopes, dreams, fears and insecurities of the men returning from the war, as well as of their families and loved ones. Will their marriages and relationships still be the same? Will their children still know them? Will they be able to find new jobs? Will they be able to pick up their lives where they left them, and will they even want to, after all that they've seen and been through? The film also hints at the fear and resentment among civilians of thousands of men returning to compete in the job market, and the lingering hostility of some people at home about America's involvement in the war. Arguably, the actors are a little too old for their roles; Andrews was 37 and March 50, while Myrna Loy was only 13 years older than her screen daughter Teresa Wright. But it's not a major problem and the performances are generally very good. Dana Andrews became a rather wooden actor as he got older, but here he gives easily one of his best and most sympathetic performances as Fred Derry, a man who doesn't fit in his marriage or his career any more. Also notable is Harold Russell as Homer. Russell was a non-professional actor who had lost his hands using explosives at an army training ground and had been seen by Wyler in the short training film Diary of a Sergeant (1945). This must have been a difficult part to play for Russell, with the experiences so close to home, but his remarkable naturalism makes him very memorable and sympathetic in this role. While the film is honest about the problems facing returning servicemen, it's also tinged with hope and optimism for the future. 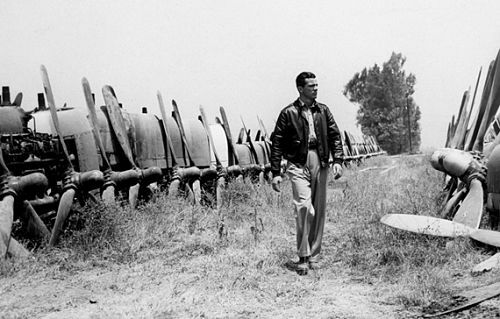 In one memorable scene, Andrews wanders around an enormous scrap yard of warplanes, decommissioned now that they are no longer needed. He meets a scrap dealer there who tells him the planes are going to be turned into scrap metal and then used to make prefabricated homes. It's not exactly swords into plough shares, but the message is clear enough, as is the symbolism of Andrews's demobbed aircrewman wandering through a field of expensive warplanes, now ready to be turned into scrap. If I'm going to nit-pick (and I will, but only briefly), the scene where Andrews explores a B-17 cockpit is let down by the fact that it wobbles furiously as he moves around it, giving away that this isn't a real fuselage but a set open at one end. William Wyler had spent a lot of time in American bombers and made the documentary film The Memphis Belle: The Story of a Flying Fortress (1943) while in the US Army Air Corps, which may partly explain the prominence of B-17s in The Best Years of Our Lives. The Best Years of Our Lives is deliberately but unselfconsciously a serious, significant film about the challenges facing servicemen returning to America following WWII. But instead of overtly presenting itself as a “problem picture” it focuses on working as a character drama about human relationships. The attitudes of the film are suggested by its ambiguous title. It's Marie who tells Fred that she “gave up the best years of my life” waiting for him to return from the war. But the film itself is unclear exactly what it means by the phrase. It could refer to the years the men spent in the war and the years their families spent without them. It could mean that, for some, their wartime experiences were actually a peak, of excitement, purpose and camaraderie. Or it could equally mean that the characters' best years can begin now, with their return from the war. Given this ambiguity, it's appropriate that each man's story is left open-ended, with the possibility of happiness, but not its guarantee. One of the reasons The Best Years of Our Lives still works for a contemporary audience is because, while it's firmly and irrevocably a film of the immediate post-war years, the problems the men face still have a universal quality at heart. On the one hand, the challenges they have to overcome are definitely of that generation and era, the effects of war injuries, of PTSD, of men returning from war in their thousands to a difficult job market and uncertain future. But The Best Years of Our Lives still feels relevant, because people still have failing marriages, they still feel stuck in jobs they dislike, they can still feel alienated from their families and they can still be uncertain about their futures. While many in the industry thought that audiences would prefer escapism, the makers sensed that the film would strike a chord with the public. They weren't wrong. The Best Years of Our Lives became an enormous hit, second only at the time to Gone with the Wind (1939), and steamrollered RKO's own returning vets production Till the End of Time. The film caught the mood of the times perhaps like no other film, not only in the US but in other countries too. Unsurprisingly, the film was also a huge hit in Britain, where thousands of returning servicemen were facing similar problems. This is the film of which Goldwyn supposedly said "I don't care if it doesn’t make a nickel, as long as every man, woman and child in America sees it." The critics were rhapsodic and the film swept the board at the Academy Awards, winning seven Oscars, beating Frank Capra's It's a Wonderful Life and Laurence Olivier's Henry V for Best Picture. It also won Best Director, Best Actor for Fredric March, Best Supporting Actor (Harold Russell), Best Screenplay, Best Music Score and Best Editing, and Samuel Goldwyn also received the Irving G. Thalberg Memorial Award for his body of work as a producer. 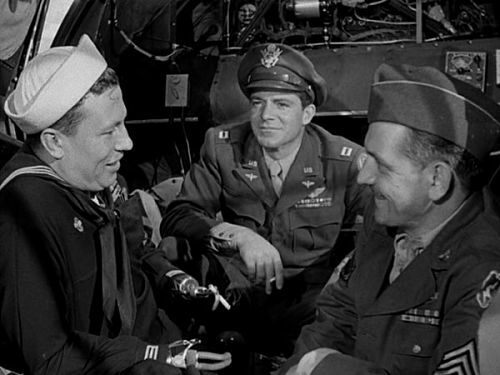 As well as winning Best Supporting Actor, Russell received a special Oscar "for bringing hope and courage to his fellow veterans through his appearance in The Best Years of Our Lives", thereby making him the only actor to receive two Academy Awards for the same performance. The film was William Wyler's last film for Goldwyn and is certainly the best film produced during their partnership. Wyler would enjoy great success in the 1950s with Roman Holiday (1953), The Big Country (1958) and another Academy Award Best Picture winner, Ben Hur (1959), but I'm not sure he ever quite hit the heights he did with The Best Years of Our Lives. The film remains one of the best depictions of the problems of men returning from war, and one of the best American films of the 1940s.